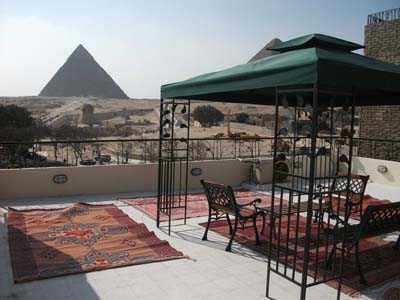 The pyramids View Inn is an American owned bed and breakfast with the best full view of the 3 pyramids and sphinx in all of Cairo. 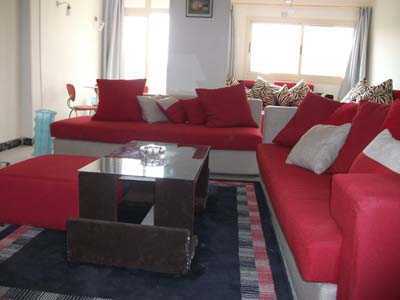 All rooms are air conditioned, living room, American kitchen and balcony. 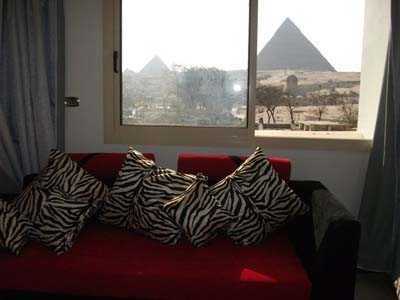 Come and enjoy fantastic views of the pyramids! 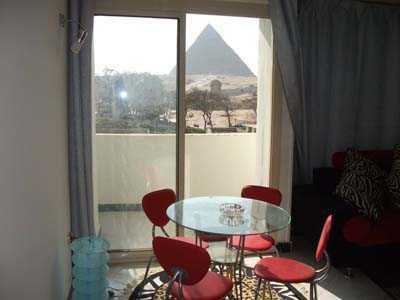 All rooms with air condition and (hot & cold water) living room with American kitchen and balcony overlooking the Sphinx. The rooms, furnished with an elegant and luxurious wooden ceilings and marble floors, offer the most modern standards. Each room has quality fittings, air conditioning, TV color satellite, ISDN fast internet connection, direct dial telephone and . All rooms are equipped with emergency lighting. Free Airport Pick Up On Arrival, free internet, pyramdis view room, american kitchen, fire alram, tv, ref, parking, Wi Fi. Free Airport pickup on arrival.